DREAMING DOES CREATE A NEW REALITY! As my first blog I’d like to share with you the story of how I’ve used the tools of positive change in my own life. When we live our best lives we create a firm base to share our unique gifts for empowering others and promoting positive change in the world. Click here to listen to the audio version of our story. Life on hold? Not ours! I recently moved from Napa to Sonoma California…and have a triumphant personal story to share. In 2006 my husband Rich, and I decided we needed a “Roadmap” for our future. I was about to hit 55 and Rich, a young at heart 63. We wanted to bring new joy and partnership into our lives. Using the “Roadmap to Meaningful Midlife”-my own coaching workbook, we began our own joint planning process for living our next vibrant 20 plus years together. Our vision included a new home within a community of like-minded people, closer to the Pacific Ocean and the San Francisco Bay Area where many of our “chosen family” of friends live. We wanted to be close to nature with more land for growing our own grapes and produce. We needed to sell our house to make this dream a reality. This seemed impossible with the downturn of the housing market. But our vision was not just a dream but a jointly-agreed upon action plan that kept us moving forward despite an economic downturn. Fast forward two plus years and a big part of our joint plan has been fulfilled. 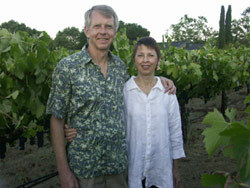 We’ve sold our home in St. Helena, Napa County California and have moved to West Sonoma County. I encourage each of you to KEEP THE VISION IN YOUR LIFE for yourself and for the positive outcomes you wish to create for your family, your community and the world during this difficult economic downturn. Don’t put your life on hold because of challenging circumstances. Take advantage of the energy that comes from dreaming and get moving on your vision one step at a time beginning NOW. What would this look like for you to take one next step that will move your thoughts about what you want into a tangible, physical form? Perhaps it’s picking up a piece of paper next to your computer and jotting down what you yearn for and get clear about what it would mean to have it fulfilled.”I want work that gives me meaningful connections with others and fills my financial need so that I can begin each day excited that life is good!”. Or your next step might be talking about your dreams and desire with your spouse or a friend and asking for support by setting a time to brainstorm with you. Be the Pathmaker for your own life by taking your first step RIGHT NOW with an immediate, incremental physical form of action. That’s what will move your dream into a reality. Learn how to TURN YOUR DREAMS INTO REALITY! WANT TO USE THIS ARTICLE IN YOUR EZINE OR WEB SITE? You can, as long as you include this complete statement with it: Certified Life Coach and Philanthropy Consultant, Mary Radu, guides midlife individuals and couples to discover how to share their unique gifts and be positive change makers. Let Mary and Pathmaker Coaching help you design and execute your unique path, aligning your life with your passions and values. If you’re ready to get moving, check out our Resources or contact Mary mary@pathmakercoaching.com to discuss how you can get supported to make a bigger impact 707.824.8836. Fantastic! Makes me wanna drop everything and create my own roadmap NOW! Very inspiring! Thanks so much. You too can do it! If you already have the desire and you're wanting tools to help, see the free resources along with the Roadmap to Meaningful Midlife audio/workbook available on http://www.pathmakercoaching.com/resources . Next post: Want To Be a Positive Change Maker? Be Here NOW!